I thought why hide your favorite jewelry in a box when you can wear it and display it! To accomplish this, I incorporate pins into my needlework designs & have named them, “Pinsations”. The pin is added to the piece so that the pin can be removed, worn, & replaced. And, without the pin, it still looks like a finished needlepoint piece. In this piece, the frog pin is one I’ve had since I was a child & the legs move. It’s not a large piece, about 6″x6″, & sits in a holder just like a fishbowl. I had to keep this piece – I just love it. I used a variety of threads including DMC floss, DMC Cotton Perle #5, Kreinik, & Snow. 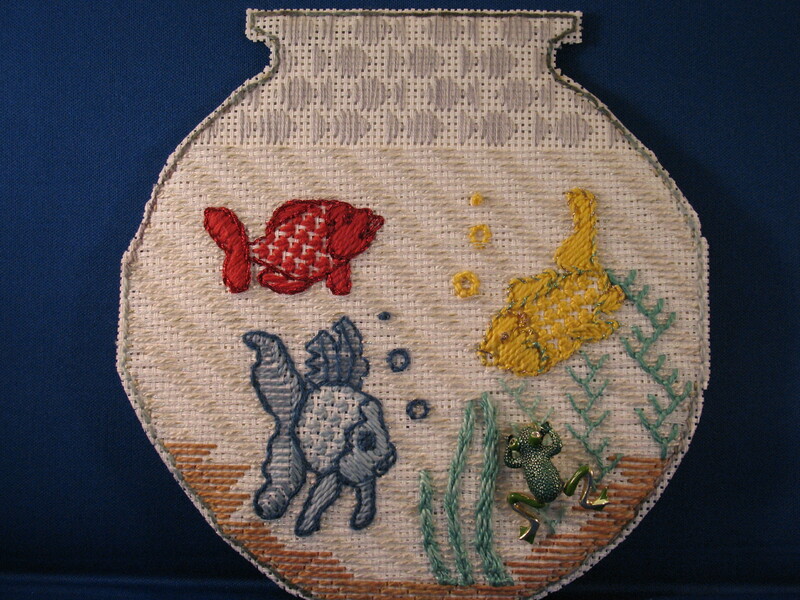 I can’t find a list of stitches used although I recognize a darning pattern for the little fish on the top (in the air). The plant life looks like whipped running stitch & featherstitch. The water looks like whipped running with DMC Cotton Perle white as the base stitch placed horizontally but shifting row by row always one thread to the right to create the slope for movement & Snow whipped through it to get the shimmer effect. As with the crosses, this was made on 14 count vinyl canvas. The canvas is available from www.crafterspride.com (under Fabrics). I cut an identically shaped 2nd piece, stitched my name & date on it, placed poster board placed between the 2 pieces to be rigid enough to stand without framing, and tacked them together, with small stitches along all sides using a vinyl thread.